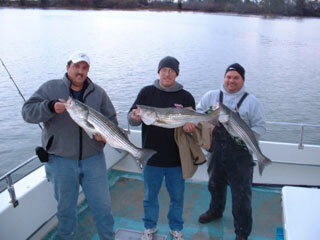 And here we have part of the Dave Reynolds crew from November 30, showing off some of their catch of big stripers to 39 inches. 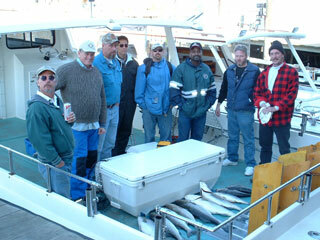 Here we have another crew from North Bay Distributors, led by Mike Fox (far right), from November 24. 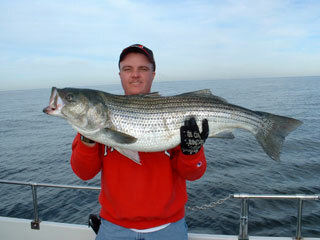 Although we didn't find a limit of big fish (those over 28 inches), there were a few trophy-sized rockfish mixed in. 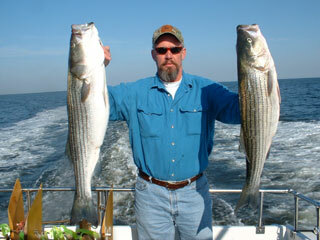 Here's Charles, one of the above crew, with two nice stripers he caught on the same double rig! 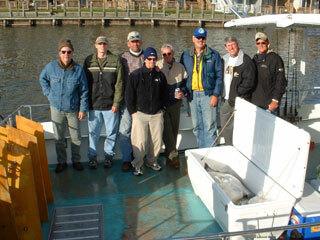 And here's the Phil Tillette (far left) crew of November 22. 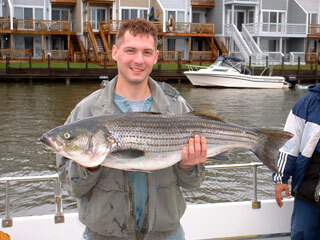 Here's Phil with one of the trophies caught that day. Click here for more. Here we have the Art McCrea (far right) crew. While we didn't catch all the fish we hoped for, we did catch a couple brutes. 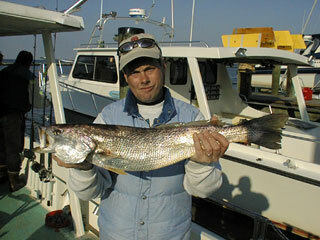 Here is Roger with one over 40 inches. 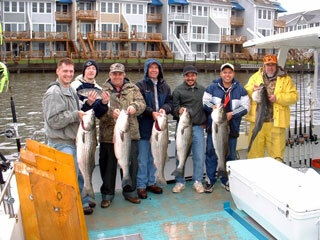 And here is another North Bay Distributor crew from November 17, shown with a fine catch of big rockfish. 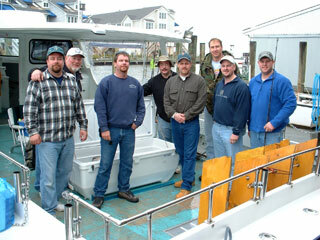 From left to right, that's Steve, Shane, Skeeter, Don Maas (crew chief), Mario, Antonio, and Larry. 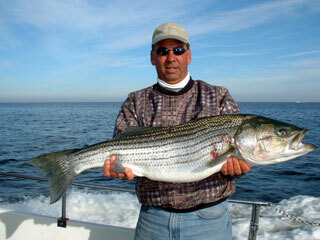 Here's Steve with a 40 inch trophy, largest of the day. 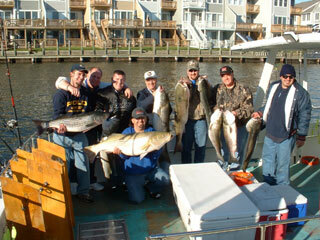 And here's the Rich Dunn (2nd from right) crew from November 15, shown with some of their catch of stripers. 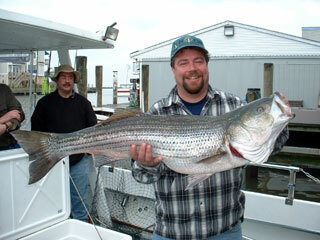 Here's Rich with a 41 inch monster. Click here for more. 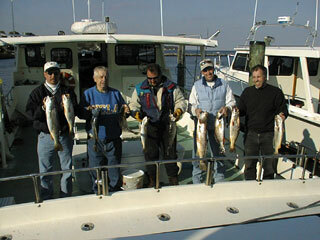 Here's an enthusiastic crew led by Jim Duncan (5th from left), out for a day of fishing for stripers and seatrout on November 10. 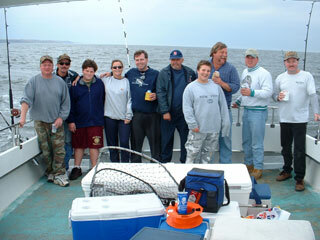 Unfortunately, a photo of this crew with their fish didn't come out. 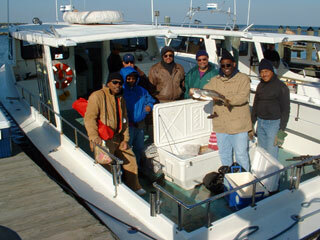 And here we have the Addie Hill (2nd from left) crew from November 2, after catching a good bumch of seatrout.